We are a leading Manufacturer of automatic fruit jelly cup filling and sealing machine, automatic jelly filling and sealing machine and jelly processing machine from Ambala, India. Cups To Be Filled Should Be Loaded On The Cup Stacker Unit. When The Machine Is Started, Cups From The Cups Stacker Unit Gets Loaded On The Main Conveyor Of The Machine. (6, 12, 24 Cups Are Loaded At A Time On The Plate Of The Main Conveyor). Conveyor Carries These Loaded Cups Towards The Filling Station, In Which The Filling Operation Takes Place. 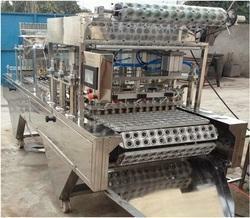 Single Filling Station Is Provided, Here The Cups Are Filled Through Pneumatic Solenoid Filler. The Filled Cups Then Move Towards The Sealing Unit, Here Film Gets Sealed Over The Mouth Of The Cups Simultaneously It Gets Cut Also. Cups With The Sealed Film Placed Over It Moves Towards The 2nd Sealing Station, Where The Sealing Operation Takes Place Again Followed By 3rd Sealing Station Which Ensures The Sealing Is Proper Leakage Free. The Completely Sealed Cups Then Moves Towards The Unloading Unit. Here The Sealed Cups Are Ejected. Frame Structure In S.s And Product Contact Parts In Stainless Steel – 304. Aluminum Plate For Cup Holding. Simplex Chain With Attachment For Aluminum Plate Fitment. Guide Support For Aluminum Plate. Tank Capacity 20 Ltr In Stainless Steel – 316. Low Level Indicator To Stop The Machine When The Level Of The Product To Be Filled Goes Below The Desired Set Level. Solenoid Type Valve Filler – 2 Nos. Uv Lamp Sterilization Provided For Empty Cups Before Filling. 350watt Cartridge Heater – 2 Nos.